Magicard Rio Pro Duo - Double-sided Printer with Smart Card Encoding, USB and Ethernet Interface, 100 Card Feeder and 70 Card Stacker. Printer comes standard with Holokote watermark technology, edge to edge printing, and rewriteable capabilities. Ideal for Enterprise and education identity applications. 3 years UltraCoverPlus warranty and support which includes full printhead coverage and free loaner service. Includes US power supply cord and USB cable. Order ribbons, cards and software separately. 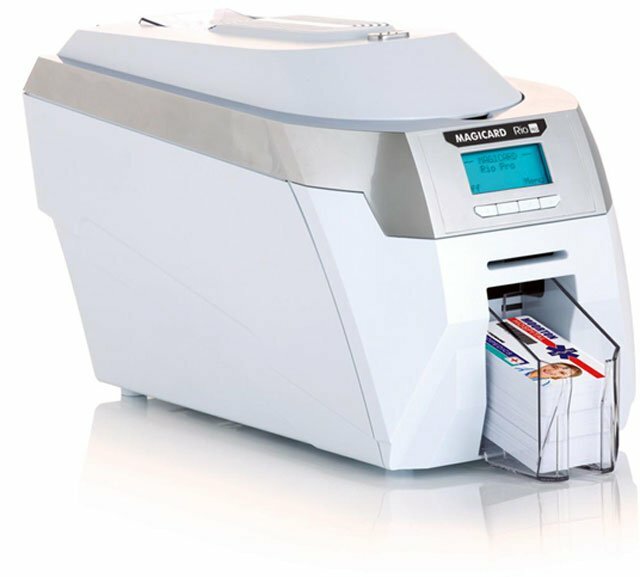 Built for professionals, the Rio Pro"s superior card printing quality is complemented with a full range of options: single or double-sided printing (with field upgrade available), batch or one-off card printing and secure encoding with magnetic stripe, contact and contactless technologies. Built-in Standard HoloKote can also be customised to an individual logo or security design. The Magicard 3652-0023 is also known as Ultra Electronics Card Systems	MGC-36520023	or 36520023	.